Many years ago, when I first got interested in exploring extreme sports, I was studying for a master’s degree in sport and exercise psychology as well as working in the adventure industry. I was reading research that explained participation in terms of risk-taking personalities searching for thrills and excitement, while working with people who spent a great deal of time being careful. My experience with people did not match the research I was reading. I think one of the major issues at the time was that the models used to study extreme sport either came from traditional sports or the clinical field. So either extreme sports were seen as competitive sports or deviant activities. Hence the idea that extreme athletes are either trying to ‘conquer the elements’ or had something not quite right with them. I didn’t get round to undertaking the study at this time, which actually worked out well, but the idea had formed, and after my master’s I looked for a PhD opportunity. When I did begin a formal research project on the experience I was interested in exploring the most extreme sports, for example, BASE jumping, big wave surfing, waterfall kayaking and solo rope-free climbing. To begin with, potential participants were quite wary of being approached because they are so often represented negatively as thrill seekers and adrenaline junkies. However, when people realised that I really was after their story, participants were highly articulate, with profound insights – not only to the extreme sport experience as something that stands alone, but as something that is an integral part of being human. What’s different about your approach and this book? In the very early days I was going down the same route, of holding predetermined notions of risk and thrills, adopting a theory (such as sensation seeking) that satisfied this notion, and testing participants. The approach I eventually took, phenomenology, starts with the notion of not knowing anything about the experience that you wish to investigate (and there are processes that researchers need to follow to help with this) and then encourages the researcher to explore. For example, by asking those who do know what it is about. In most areas of study this approach (when followed properly) highlights differences between the traditional theory-driven approach and the lived experience. The book introduces the reader to phenomenology and the practice of phenomenology and then works through the traditional approach to understanding extreme sports before presenting the phenomenological description. Have you taken explanations based on hermeneutic phenomenology back to the participants, in those terms, and if so how were they received? As part of the research process the final description was sent to participants to ask for feedback. In the end this is not essential because the researcher’s insights can add depth to an experience, but the process can add to the findings. All participants were happy with the interpretations and many reported that the descriptions had revealed aspects of the experience that they could not quite express. Beyond this I have had people contact me who were not part of the project just to let me know that the thesis puts words to an experience that they struggled to articulate. In fact, the film based on my research came from that very reason. In the extreme, can we find themes that unite psychology? For the moment it is early days but research is now exploring gender differences, personality, neurological activity, decision making, and using ecological approaches, cognitive approaches, positive psychology approaches and social psychological approaches. Extreme sports are really for anyone who wishes to give them a go. You do not need a special personality or be from a particular gender but you do need to develop a sound understanding of self, the activity and the environment. The benefits are profound and change the way participants experience themselves, others and the environment. Have psychologists researched how extreme sports participation affects those around the participant? A desire to live life to its fullest. They are highly trained and thoughtful athletes. 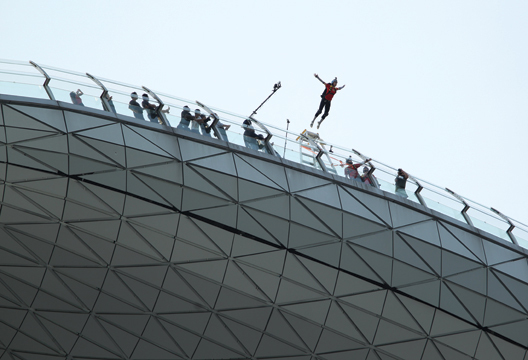 For example, a BASE jumper noted how he read all the death reports in order to work out what not to do. Of course things can still go wrong and when it does the margins are small. But then a couch potato is guaranteed to knock 10 years off their life. Adventure is an important part of being human, it teaches us about what we are capable of, lets us find out how capable we really are, opens up doors to discovering our own inner capabilities and facilitates growth. Of course we do not all need to take adventure to the extreme. However, most athletes that do choose extreme sports are adamant that they work well within their comfort zone just in case they need to tap into something a bit more because of an unforeseen challenge. This is perhaps another way that extreme sport athletes are different from traditional sport athletes. They never give it all, in the sport metaphor way. Having said all that, yes of course it is a worry for family members. Some of course have no choice in being connected to extreme athletes, others do have choice and perhaps that makes a difference. However, I remember talking to one partner who suggested that if their partner was not doing what they loved to do, then they would not be who they were. All those you spoke to were clear that words were inadequate tools for exploring core elements of their experience. Yet were there times when what they said brought you up short, made you think ‘that’s a really key psychological insight’? I suppose the most interesting aspect in general was that rather than describing the experience as exciting, loud, thrilling – as would be expected from the traditional perspective – and also evoked when watching YouTube videos with heavy rock music – the experience was spoken about as relaxing, free, quiet, calm and mindful. The complete opposite. I am still involved in research in this area and gradually attempting to reveal the experience… we hope to know enough about the experience to perhaps use aspects as psychological interventions. We have already started this with investigations into sports such as parkour, skiing, parachuting, snowboarding as a mental health interventions. Adventure generally seems to be a very powerful facilitator of profound change.